We can accept your order now for the full $420 voucher amount! Follow the steps below to place your order. Find the Letter Carrier/MVS items you want and add them to your cart. When finished, select the "Checkout" button. IMPORTANT: Please check the size chart for your proper sizes in postal uniforms. This is especially important for women as the uniforms are not sized the same as your regular clothes. Complete our secure checkout form. If your order exceeds the Voucher amount use the "Other Payment" section to enter your personal credit card information. Your personal card will not be charged until we receive payment from the USPS under the Voucher program. We will need your Letter of Authorization in order to process your order. We ask that you email or fax it, so that we may begin the payment process and get your order to you as soon as possible. Please fax to 954-739-3994, Attention: PUUS/CCA/TE, or scan and email to support@postaluniforms.us. Please mail the original Letter of Authorization to Postal Uniforms US, PO Box 190145, Inverrary, FL 33319-0145. Your order will ship when we can confirm with your station manager that payment will be authorized. Replacement insoles are now allowed to be charged to your USPS allowance. Make your shoes last longer by replacing worn out insoles. Order now! Replacement Insoles. We are now introducing gloves that have fingertips customized to work with touch screen phones and tablets. Our four way stretch gloves and fleece stretch gloves are super comfortable and will work with your touch screen devices. Available now! Fingertip Gloves for Touch Screens. Want a merino wool sock? We got them. Newly approved sock features a soft merino wool blend. Merino Wool Socks. 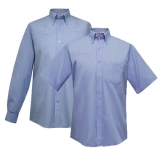 The USPS has authorized a brand new design of the Retail Clerk dress shirt. The new shirt is light blue and made of 65% polyester / 35% cotton blend which makes for comfort and easy care. The new Retail Clerk Shirt is available in men's and women's long and short sleeves. All sizes in stock. Shipping is free! Order now! New Retail Clerk Dress Shirts. 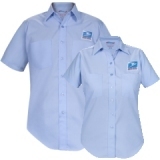 The USPS authorized release on October 15th 2010 a brand new design of the short sleeve, long sleeve, and jac shirts (the polo shirt will stay the same). The new shirts are a solid light blue and will include the same emblem. There are no stripes. The cut of the shirts will stay the same. The fabric remains a 65% polyester / 35% cotton, but will now be a poplin weave as opposed to the current shirts which are a broadcloth. Poplin weaves are a little smoother in appearance and to the touch. The shirts are still machine washable but now have the addition of soil release which provides increased protection and ease of care against stains and soiling. Available now! New Letter Carrier Shirts.